Got a budding Spanish speaker in your house? MindSnacks is today’s Free App of the Day, and will help your little one learn to say “Hola” faster than you can flip a tortilla. 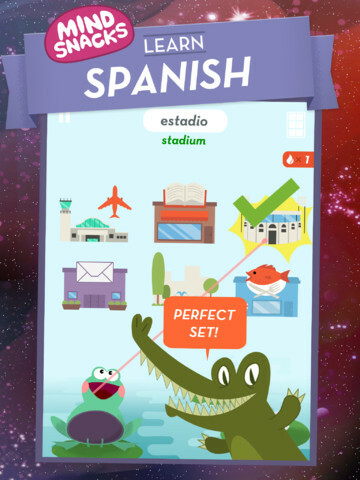 Start reading, speaking & learning Spanish today with MindSnacks! Our language apps feature 9 addictive games that build essential vocabulary & conversation skills. Perfect for students or travelers of any age who want to learn Spanish. “Learn Spanish” includes one free lesson for your enjoyment! Upgrade to activate all 50 lessons and you’ll quickly have no problem understanding everyday Spanish. Learning Spanish for school, work or travel? MindSnacks makes it easy to learn languages with 9 challenging games you’ll want to play again and again. Each game teaches a specific aspect of a new language, creating a well-rounded learning experience that goes far beyond basic vocabulary flashcards. You’ll quickly be less reliant on an Spanish dictionary or phrasebook — plus you’ll learn the grammar and vocabulary you need for traveling in Spain or other Spanish-speaking countries. Our unique algorithm reinforces this learning process using proven methods from the field of memory studies. Over time, the games adapt to your individual performance, selectively repeating Spanish words, phrases and grammatical points with which you struggled in past lessons. Complete the lessons, games and side quests, and your avatar will grow smarter and brighter — just like you. Great for people just starting out with Spanish as well as beginner and intermediate learners! Did not like the fact that I had to “log in” to use it and the free version only gives you one lesson. That’s a lot of storage requirements for one lesson.